This was to have been a flying model of a proposed six-engined trans-Atlantic passenger transport weighing 100,000 kg. The span was to be 40 m with an aspect ratio of 10 and sweepback of 28 degrees. Power units were six Argus AS 10 C engines. To make the aircraft attractive to R.L.M. 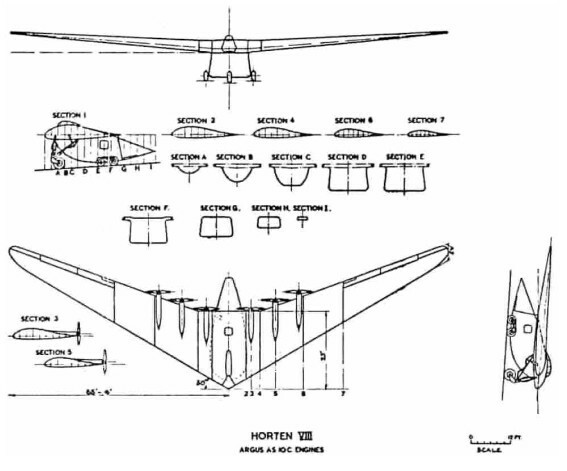 and thus get backing for the project, the Hortens added a rear loading cargo carrying body with an internal space approximately 14’ x 10’ x 6’; this was not part of the design for the full size aircraft. With construction under way, another modification was made (but not disclosed to R.L.M.). This consisted of removing the nose of the cargo body, replacing the nose wheel by wheels on either side of the body and putting a large venturi tube with a 2m x 2.7m throat inside to form a flying wind tunnel. They expected to get about 500 mph airspeed in the throat combined with low turbulence – this they proposed to check by the sphere drag method. Later they hoped to be able to test models of their aircraft which could be made of wood because of the absence of dust in the airstream. Construction was proceeding at Gottingen and was 50% complete at the cessation of hostilities. The steel tube framework for the venturi center section was finished. At 23,000 kg the sea level rate of climb at full power would be zero. At 9,000 kg rate of climb at 180 kph was expected to be 6.5 – 7 m/sec. Trailing edge split flaps with a constant chord of 80 cm were to be fitted between the engines. Drag rudders were of the H VII “trafficator” type with vent hole balance plus spring centering. Projection was about 1 meter. Wing Root thickness is about 16%, with the usual reflexed center-line, graded to an 8% symmetrical tip section. Wing structure was in seven parts; a welded steel center section with pilot and co-pilots seat and three outer wooden wing panels per side. The wooden structure was of single spar D-tube form with subsidiary trailing edge ribs. At the factory in Gottingen the center section was found in a semi-complete state, D-noses for the inboard wing panels were finished and spars and ply noses for the outer panels were under construction. Much of the work on components such as engine bearers, petrol systems, undercarriage etc., had been completed and the six engines were in crates at the works, with one spare. Unfortunately all drawings had been taken and many of them seem to have been buried by Horten employees near Kilenburg, in the Russian sector. The fixed main wheels were arranged in tandem pairs on either side of the fuselage and took 85% of the static weight of the aircraft. The castering nose wheel was retractable on the cargo version and had to be mounted on a stalky strut because of the high wing layout. Static ground incidence was 2.5 degrees.